Have you ever put on a pair of shoes and they just felt so right and comfy that it’s almost like the running gods were smiling down upon you? I’ve long been a fan of the PureFlows, but this shoe just hits all the marks for me like no shoe has ever done before. 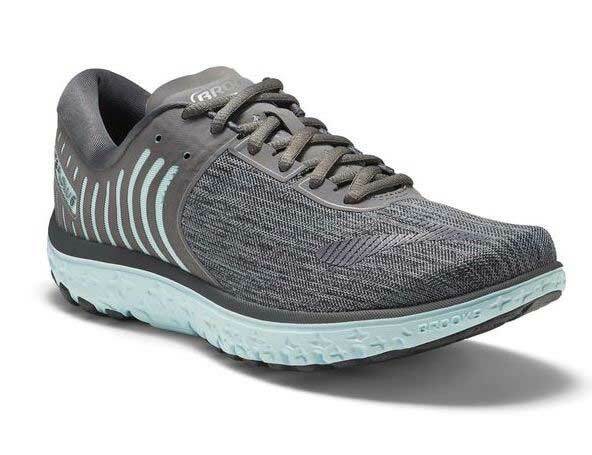 It’s light and minimal but still with a little cushion for springiness, it’s great for shorter runs (you know me — no long distances here, haha) and performs well with cross-training. (I love it for circuit training and boot camps that incorporate some but not all running.) The heather upper and color options are BEYOND CUTE, too (literally the cutest shoe I’ve ever seen — and I don’t use “literally” lightly), so you can wear it here, there, to the gym, out to brunch and everywhere. They are also ridiculously comfy. They almost have a slipper-like coziness to them, although there’s still support. They just fit basically like a glove. In other shoes, sometimes I have issues with the heel chafing (even if I’m wearing socks with a tab on the heel) or the laces/tongue area rubs or feels unnecessarily tight, or sometimes it moves around on the top of my foot. Not with these though. No chafing, no rubbing, no moving, no tongue being annoying — all perfection. I feel like they were basically made for my feet. I hope your feet feel the same. I love it when you get a new pair of trainers and they fit like a glove! I’m still wearing my pair of Nike Air Pegasus and I love them. I’m due to renew but I can;t bring myself to throw them out just yet, haha! If you want to reduce the body fat then it is necessary to use running shoes during jogging in morning with exercise and also follow the diet plan with the instruction of your gym trainer or a doctor . Your post is amazing about the information of running shoes ,The running shoes help me to run fast in street race and also give a chance to win the race. I love running shoes . i like this article it gives us a lot of information which is very useful for me and and for others also i appreciate for your choice please keep it up. Great review! My sister just bought a similar pair for her jogging routine and she’s been telling us how much she loves it. I’m considering to buy my own pair really soon! I agree with you Jenn, wearing the proper running shoes can make all the difference, not only in your performance, but in your overall orthopedic health. Unfortunately, most shoes on the market are all about fashion, bypassing comfort which leads to painful foot problems like bunions, hammer toes, or even plantar fasciitis. Some of the things we need to consider when buying running shoes are the perfect fit, appropriate style for the sport, and even ankle support which are often neglected.